Looking for an environmental documentary to watch? We have selected our top ten favourite documentaries that explore the complexities of plastic pollution and its effect on our environment. Varying from short to long, funny to shocking, our selection presents the environmental and social challenges posed by plastic and the incredible efforts of people around the world working to save the planet. Ready to learn and be inspired? Crack out the plastic-free snacks, relax and pick one to watch! Here an unusual crew of surfers, a musician, spearfisher, bodysurfer and marine scientist embark on a one-week voyage to the Sargasso Sea in search of the infamous patches of floating garbage. Instead what they encounter is an unnerving ‘fog’ of microplastics. A mesmerising 30-minute watch. The soft tones of David Attenborough. Out-of-this-world music by Hans Zimmer. Beautiful and mind-boggling sea creatures. If that isn’t enough to persuade you to watch this award-winning series, I don’t know what is! This BBC series explores the wonders and fragility of the marine world. The stunning visuals filmed in 39 countries will both astound and shock you, leaving you wanting to do more to protect our oceans. Because, as David says, ‘the future of all life depends on us’. Join the Oscar-winning actor Jeremy Irons in his feature length film to ‘discover the extent and effects of the global waste problem, as he travels around the world to beautiful places tainted by pollution’. This is important and informative viewing, highlighting the power of changing our way of living to help ensure the sustainable future of the planet. David Attenborough said this was ‘one of the most important films of our time’. And with that review, I’m sold. This award-winning film started as an adventure to try and film the magnificent blue whale in the Indian Ocean. What they found there was something even more enormous – a thick layer of plastic litter. The documentary then follows a filmmaker and record-holding freediver on their journey across the world to report on how plastic is damaging our seas and what is being done to try and stop it. 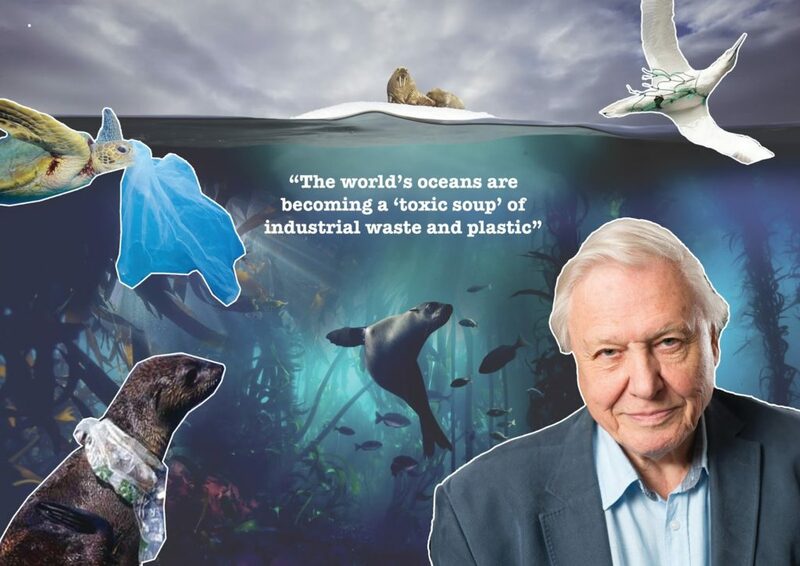 Discover the dangers of plastics to the marine world alongside wildlife biologist, Liz Bonnin, marine scientists and campaigners in this shocking and revealing documentary. It does not shy away from the horrors of plastic damage and contains some shocking and heart-breaking scenes. It is a hard, but very important watch about the consequences of our over-use of plastic. This is a film made by 13-year old Dylan D’Haeze to help kids, and indeed adults, understand the issue of plastic pollution and what we can all do about it. Dylan wanted to know what happened to plastic when it is thrown away, so he started to investigate. This is a truly inspiring, and very informative, film from a 13-year old perspective that shows us all how kids really can save the planet. Jeb Berrier, an ‘average’ bloke, decides to stop using plastic bags. This get’s him thinking about all things plastic, and thus begins his journey to get to the bottom of the truths behind plastic. This often-hilarious story will answer all of your questions about plastic: what is it? Can it be recycled? How does it affect us? Instead of feeling disheartened and gloomy about the state of the planet, this documentary will leave you feeling empowered and ready to jump into action. Trying to live a zero-waste life? This documentary follows couple Jen and Grant in a head-to-head competition to see who can produce the least waste in a year. The Clean Bin Project is a funny and entertaining review of the serious issues of consumerism, packaging and plastic, and gives some great ideas for how to reduce the waste we produce and make a difference in our everyday lives. This short 30-minute documentary explores the history of straws and the problems of single use products. Narrated in parts by Oscar-winner Tim Robbins, it’s an interesting watch suitable for all ages. You definitely won’t be using straws again after watching this! Made as part of the Sky Ocean Rescue campaign, this 45-minute documentary dives deep into the complexities of plastic pollution, gathering information and viewpoints from people across the world. The problem is large and serious, but ‘A Plastic Tide’ gives us hope and shows that there are amazing and inspiring people everywhere trying to solve this problem. As Mumbai-local Afroz Shah says: ‘cleaning up rubbish is addictive’, and we agree. Together we can make a difference. Looking for more inspiration? Here are a few more entertaining and thought-provoking documentaries that are definitely worth checking out!